In a report released today by research firm NPD Group, it was shown that the sharp growth of the Android OS over the last two quarters has helped it surpass the iPhone and secure the number two spot in US smartphone share behind BlackBerry. 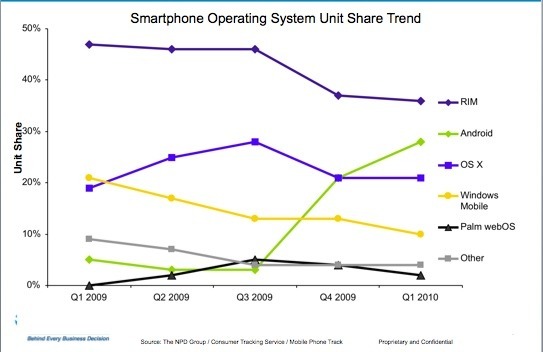 Android’s remarkable growth can be attributed in part to the large success of the Motorola DROID on Verizon. Android has also done well due to the fact that it has permeated all the major US carriers, with models available such as the HTC Hero on Sprint, and the Motorola BACKFLIP on AT&T. CompanionLink has been on the forefront of Android synchronization, offering support for Android since the flagship T-Mobile G1 launched in 2008. CompanionLink now offers two methods to sync Android – wired USB sync and wireless sync through Google. CompanionLink is planning to soon launch DejaOffice for Android, an integrated suite of calendar, contacts, tasks and notes apps that provide more advanced CRM functions than the native Android apps. As Android continues to sweep the market, CompanionLink has lots of great things planned for the future. Stay tuned! This entry was posted in News and tagged android news, android phones, android sync, smartphone news by Andy Sheragy. Bookmark the permalink.